U.S. GDP grew by 4.1 percent during the second quarter, according to the initial release. This is the largest increase in GDP since it grew by 5 percent in the fourth quarter of 2014. The spread, or difference, between the yield of a 10 year U.S. Treasury bill and a 2 year U.S. Treasury bill fell as low as 24 basis points in July. This number, which is viewed as a reliable predictor of recession once going negative, is at its lowest levels since 2007. The spot price of lean hogs (i.e. pork) fell by 33.65 percent during the month of July. The prices of many goods and products have been impacted by new tariffs levied by Mexico and China. Pork has been one of many good that are being targeted. With less demand (because of higher end prices from tariffs) for these goods, supply increases thereby pushing prices lower. 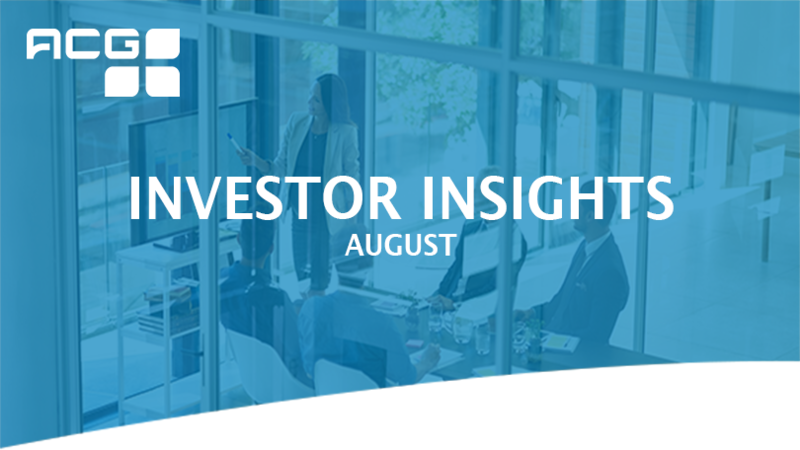 A strong start to earnings season, robust economic news and an easing of global trade tensions resulted in a great month for stocks in July. All major equity asset classes, domestic and international, posted positive returns. There was a pullback in terms of the prevailing trends seen through the first half of 2018. Value stocks finally outperformed growth stocks, which is largely due to the sell-off in the technology sector toward the end of the month. Another trend that saw slight reversal was the performance of small-cap stocks relative to large-cap stocks. Large-cap stocks outperformed in July, which is likely attributable to the trade situation relaxing (more on that below). Fixed income was generally flat, though high yield bonds, which correlate more with stocks, were up slightly. The yield on the 10-year U.S. Treasury Bill ticked up during the month from 2.87 percent to 2.96 percent, which created a slight headwind for fixed income returns. Surveying the current landscape provides plenty of reason for optimism through the end of 2018. It should come as no surprise to market observers that the strong earnings season is continuing. With an economy at full employment, there are more people willing to spend more money on the goods and services being sold by companies. When you throw a massive tax cut on top of that dynamic, the result gets even more attractive. According to Factset, with 53 percent of S&P 500 companies having reported Q2 earnings as of July 27, the forecasted year-over-year growth in earnings is 21.3 percent. The forecasted year-over-year revenue growth rate has also been favorable to market returns: as of July 27, companies in the S&P 500 were forecast to grow sales over last year by 9.3 percent. These numbers are incredible, but in fairness there is something artificial about comparing earnings from a year when the corporate tax rate is 35 percent to a year when it is 21 percent. Year-over-year earnings growth in 2019 will likely be lower, if for no other reason than we will once again be comparing two years with the same tax rate. This will be important for investors to keep in mind in 2019, as it should not necessarily indicate an economic slowdown if and when we see corporate earnings below 20 percent. The first reading of GDP growth in the U.S. came out at 4.1 percent. This was the highest GDP reading since Q4 2014, but surprisingly was a slight disappointment relative to the expected 4.2 percent. Whether or not it met the consensus expectations of economists is less relevant (if for no other reason than the actual number will get revised anyway). 4.1 percent is a strong growth rate and is cause for optimism. The employment picture remained strong in July as well—213,000 nonfarm jobs were added in June. Counterintuitively, the unemployment rate went up from 3.8 percent to 4.0 percent, but this was driven by an increase in the labor force participation rate. This provides another cause for optimism as more currently unemployed Americans appear to be feeling better about the economy and thus choosing to seek employment. Wages are, on average 2.7 percent higher than this time last year; this isn’t a huge increase but should still be considered healthy. The Trump trade crusades can also be said to have improved somewhat in July, though only slightly. President Trump met with the President of the European Commission on July 25th; the meeting resulted in Trump agreeing to hold off on placing tariffs on auto imports from the European Union. This represents a significant step back from the brink, at least between the U.S. and Europe, because if auto tariffs were enacted then it is likely to have marked a major escalation. Concerns around trade are still plentiful—not only with the EU but also with China and other countries. But markets appear to have interpreted Trump’s backing-down over auto tariffs as an indication of his willingness to cool the trade rhetoric elsewhere. With corporate and economic fundamentals as they are, the equity markets are ripe for growth for the remainder of the year. As always, there are potential flashpoints that could induce volatility. In addition to the trade tensions described above, markets are concerned about the pace at which the Federal Reserve will hike interest rates. The consensus still suggests that the Fed will hike rates twice more in 2018—once in September and once in December. Unless inflation begins to pick up steam, this will result in more flattening of the yield curve, which is historically observed as economies begin to slow down.